This trip was the first time in my memory of every going to Tom Sawyer Island at Disneyland, although I probably went when I was little. It is definitely the first time Mik has ever been to the island. We have always avoided it because we had heard that once you get there there is no where for wheelchairs to go and do anything. Well, we finally decided to check it out for ourselves and discovered this was an overgeneralization. 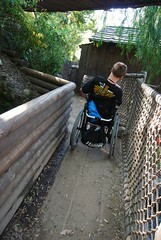 It is true that for the most part wheelchairs cannot enjoy the island, but there is still some things they can access. I have no idea exactly how much we really missed out on because the wheelchair could not fit in most of the cave openings or there were stairs up to the bridges, but there was still plenty to do to waste an hour on the island. 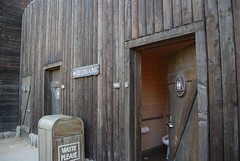 There is even a companion bathroom by the fort. 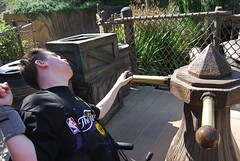 To get to Tom Sawyer Island you ride on a raft. The raft is not exactly even with the loading dock, so we had to tip the front wheels of Mik's wheelchair off the ground to safely get on board. Not too big an issue, but his new wheelchair is really hard to do that with because it is meant to avoid all the flipping over accidents Mik has ended up in at school. 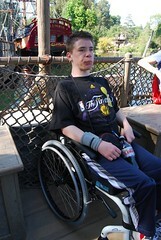 Good for his usual daily wheelchair use, not so good for adventuring. At least we did not have the tippers on, so did not have to stop to flip those up just to get on raft. On the island there certainly are places a wheelchair can go from the start. Sure, you cannot go to the left, but to the right is a rather level path. Yes, the path is dirt, but it is hard packed and very easy to roll on. We followed the path and found an area where there was a wheel that you can turn to lift a treasure chest with a skeleton out of the water. Mik was able to easily do this by himself and found it fun to do. There is also a little area where you can pump water, which we tried to do, but stunk and we notices two really in shape guys did not do any better when they tried after us. This area was overall quite accessible, although the part by the waterfall was a tight squeeze. 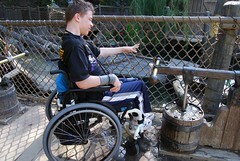 Also, there was a rolling bridge of barrels that the wheelchair could not go on. After this little area of pirate activities we continued on towards the fort. 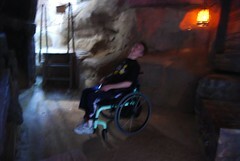 There was one cave near the hill/lift up to the fort/restrooms that was plenty wide enough to go in with a wheelchair. There was not much of interest inside, but it was cool to see Mik's new wheelchair glow in there and actually get a picture of it glowing. The hill up to the front of the fort is very steep. 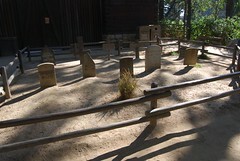 The one around the back near the treasure area is not much better. We just went up the steep on in front because Mik had to go to the bathroom and we knew they were up at the fort. 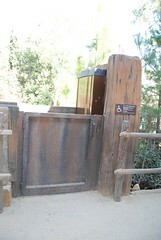 We felt pretty stupid when we go to the bathrooms and right next to them is a wheelchair lift that gets you up to them. I do not know if you can just operate it or you need to find a cast member to do it, though. Either way better than dangerously trying to go up the steep hill. Up at the top of the hill behind the fort is a little graveyard and getting around the fort and the graveyard area is relatively level, although the path is almost too narrow for a wheelchair at parts. Not really any reason to go up here other than the bathrooms, but the companion bathroom up there is great. 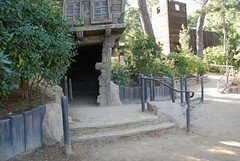 One other fun little part we found is that near one of the areas with stairs up to stuff there is a pirate ship wheel. 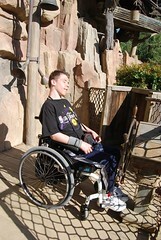 Mik rolled up to it to see that a wheelchair person could play with it, although it seemed to kiddie for him. There are also little microphones to talk into and talk with people up on top, which could be fun for groups with those that want to climb up and those that cannot. Overall we had a lot of fun on Tom Sawyer Island. 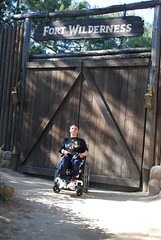 Sure, there is a lot wheelchairs cannot access or do, but there is still some fun stuff. Plus, you at least get a raft ride as part of it.